The eastern tip of Lake Minnetonka, one of the largest lakes in Minnesota. The outlet of Lake Minnetonka is Minnehaha Creek, which winds through south Minneapolis and flows over Minnehaha Fallsand into the Mississippi River. 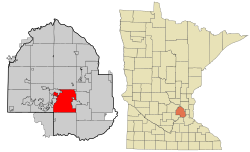 Minnetonka is located 8 miles west of Minneapolis, in Hennepin County. The Hopkins School District comprises two thirds of the city of Minnetonka, the entirety of Hopkins, and portions of the cities of Golden Valley, Edina, St. Louis Park, Wayzata, and Plymouth. In addition to schools located within Minnetonka, the Hopkins School District also includes four schools in the cities of Hopkins and Golden Valley: Eisenhower Elementary School/Xin Xing Academy (Hopkins, MN), Alice Smith Elementary School (Hopkins, MN), Meadowbrook Elementary School (Golden Valley, MN), and Harley Hopkins Early Childhood/Family Center (Hopkins, MN). The Hennepin County Library has its headquarters in the Ridgedale Library in Minnetonka. In addition the system operates the Minnetonka Library.